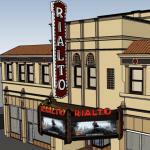 New plans for South Pasadena’s long-closed Rialto Theater were unveiled last night at a meeting of the city’s Cultural Heritage Commission. The building was sold late last year to downtown developer Izek Shomof, who has restored several historic structures including the Alexandria Hotel and Title Guarantee Building. The new auditoriums would be created from space under the existing balcony, much in the same way an enlarged lobby and concession stand replaced a few rows at the back of Hollywood’s Chinese Theater in 2002. 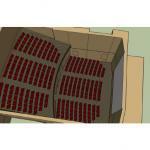 Seats, sound, lighting, and projection would all be upgraded to 21st century standards. Historic plasterwork and murals would be restored, and missing fixtures would be replicated. 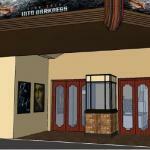 The experience from the balcony and the front half of the auditorium would be unchanged. 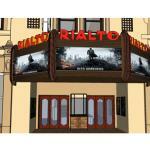 Alspaugh and his team brought new life to Coronado Village near San Diego four years ago when they restored The Village, a shuttered neighborhood movie house dating to 1947, and I have great faith in their ability to bring back the Rialto. There are still plenty of details to work out (that LED marquee is not going over well with the historic crowd), but I’m a regular at the Vista and love it. 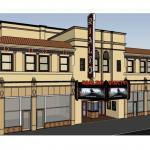 I know and trust Lance and think he is the perfect operator to resurrect this 90-year-old theater. I can’t wait for flickering images and the aroma of hot buttered popcorn to fill this spectacular and long-neglected landmark. The property owners are to renovate the Exterior Façade with the exception of the following: Install 3 LED Exterior Electronic marquee panels. Retain existing Box Office and relocate the Main Entrance doors to line up behind the Box Office allowing secure ADA entrance for employees to sell tickets and discourage transient use. Restore Murals and add new period light fixtures as needed. 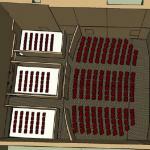 Construct 2 – 3 ADA accessible screening rooms of 50 to 100 seats each below existing Balcony.